Build understanding and knowledge with this comprehensive full-colour textbook that covers core modules across all aspects of Early Years. 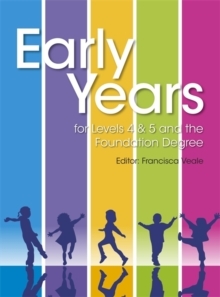 Early Years for Levels 4 & 5 and the Foundation Degree is an authoritative and accessible course textbook for anyone studying at Levels 4 and 5, whether a Foundation Degree, HNC/HND, the first year of an undergraduate programme or other higher vocational qualifications related to early years or early childhood studies. It is also relevant to those working towards Early Years Professional Status (EYPS). The textbook benefits from the expert knowledge of its authoritative contributors, including Tina Bruce, Margy Whalley and Ros Garrick.